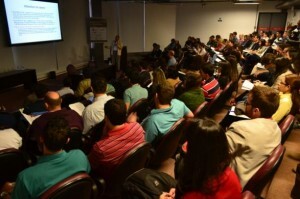 The 4th Workshop on Microfluidics was held at the National Center for Research on Energy and Materials (CNPEM) in Campinas, Sao Paulo (Brazil) from July 24-25, 2014. Since 2011, the workshop has brought together young students, researchers, and companies from different states of Brazil to discuss topics related to the fundamentals, fabrication technologies, innovations, and applications in microfluidic science. This field has been spread out around different regions of the Brazil with great contributions for fabrication technologies as well as innovative developments and diverse applications. For the second time, the event was supported by The Royal Society of Chemistry. 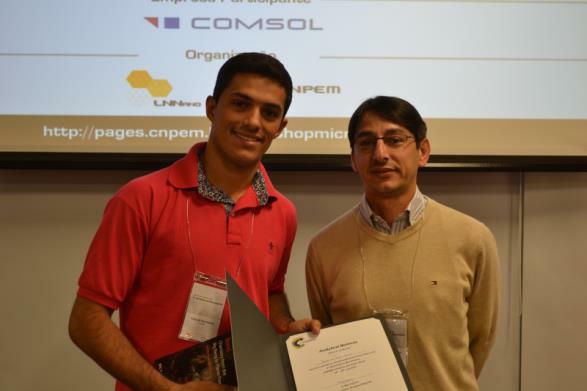 Representing the scientific board of the IV Workshop on Microfluidics, Prof. Dr. José Alberto Fracassi da Silva presented the awards to the two best posters which were granted by Royal Society of Chemistry. 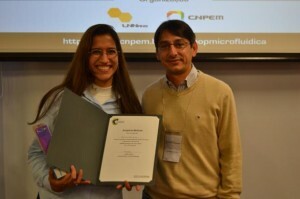 Furthermore, the “Analytical Methods Award” was considered for the innovative and original work on Analytical Science. The winner was Mr. Paulo de Tarso Garcia from University of Goias. Mr. Garcia is a Ph.D. candidate under supervision of Dr. Wendell K. T. Coltro and he was also awarded with a book entitled: “The Cosmic-Chemical Bond ”. The work presented by Mr. Paulo describes the preparation and application of paper-based microfluidic devices for clinical assays. Metallic stamp was used to delimit the microfluidic regions. The device was applied for quantification of nitrite, bovine serum albumin, glucose, and urea. The “Lab on a Chip Award”, in turn, was considered for the most innovative work in the field of microfluidics. It was given to Ms. Debora Freitas do Nascimento, a Ph.D. candidate at Federal University of Rio de Janeiro, under supervision of Prof. Dr. Maria de Fátima Vieira Marques. Ms. Nascimento was also prized with a Tablet. The developed work relies on the use of a microfluidic system to assemble monodisperse droplets containing poly(ethylene glycol), chitosan, and alginate with isoniazid as encapsulant.